Rich blue violet color on this super Tanzanite pair. Rich blue in one light, lilac blue in another. 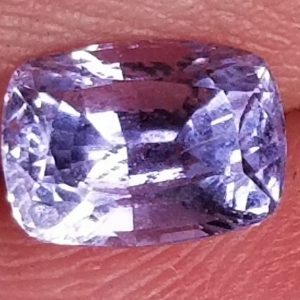 Tanzanite is trichroic which means when viewed in various orientations, different colors result.Tanzanite looks different in different lighting situations. Sunlight usually makes it look more purple. Light bulbs and candlelight also bring out the purple and can make the grayish ones look brown. Fluorescent lights tend to bring out the blue more, as do overcast skies on this.6.2×4.2mm and 6x5mm pair.